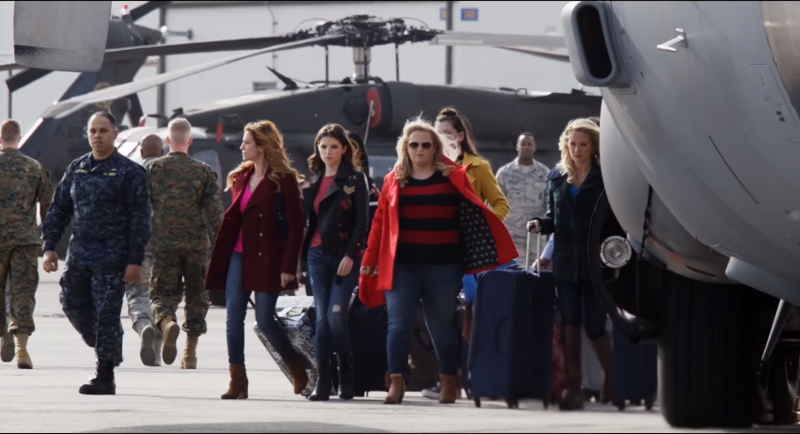 After releasing a behind-the-scenes video last week to commemorate production wrapping, Universal has just released the first official trailer for "Pitch Perfect 3." And while we loved seeing the Bellas take on other a cappella groups while attached to the Barden University name, the plot seems to be headed in a different direction. As the trailer shows, the Bellas are all college graduates now looking to make it in a post-collegiate world. There's only one problem, none of them see to be succeeding. After what appears to be some formal reunion where everyone expresses how much they've missed the group camaraderie , Aubrey (played by Anna Camp) informs the Bellas that she may have ties to a "Support the Troops" performance sponsored by the USO, which would pit the Bellas against other bands, instead of vocal groups. What follows is two minutes of antics, action and even a snippet of the Bellas performing "Get the Party Started" by P!nk. While we no doubt believe that all the big musical numbers that we have come to love in the previous two films will still be a major aspect of the story line, it seems that "Pitch Perfect 3" will be part dramedy, maybe in hopes of appealing to a wider audience. See the video below to get an idea of what to expect from the Bellas this time around.